R-Drive Image will start analyzing the computer disk configuration, the Progress... message showing the progress. Then the Partition Selection panel will show the configuration. Warnings will also appear in confirming e-mails for scheduled actions . You may select all objects on a hard drive by clicking the hard drive icon .. It will show the marked hard drive . Use the Refresh button if your computer disk configuration has been changed (when you connect a USB disk, for example). You may select any place including connected network drives, supported CD and DVD Recorders , or any other devices with removable storage. If you try to overwrite an existing image file, the Imaging Mode panel will appear. You may either overwrite the file or add to the existing image. Appended changes will be those between the saved full image and the current state. If there is no full image, it will be created instead. When restoring data, you will need the full image and ONLY the differential file created at the instant to which you want to restore data. Appended changes will be those between the last saved changes and the current state. If there is no full image, it will be created instead. When restoring data, you will need the full image and ALL files (both incremental and differential ones) created to the instant to which you want to restore data. Minimum file sizes: If you need to keep only the latest backup instant, you may use the Append changes differentially to the existing image option and delete all previous differential files. If you need to keep all instances, you may use the Append changes incrementally to the existing image option to keep overall file sizes smaller. Data safety: If any of the differential file is damaged, data will be lost only for that backup instant. If any of the incremental file is damaged, data will be lost for all subsequent backup instances starting from the damaged file until the next full of differential backup. All data in the image file will be replaced with the current one. If you choose to overwrite the file, the You are about to overwrite an existing image file... warning will appear on the Imaging Mode panel. You may either overwrite the file or select another file name for the image. If you try to append data to a password-protected image file, the Password prompt... message will appear. Enter the password and click the OK button. You may specify image options on this panel. Shows the file name for the image. You cannot change the file name on this panel. Select this option if your want R-Drive Image to check the newly created file image for its consistency. This may be useful for storing image files with critical data. Please note that this operation requires additional time. You may compress the data in the image to save space. Please note that the smaller size you select the more time will be spent to create the image file and vise versa. You may store in the image either the exact Sector by backup copy of the object or Backup useful information only , that is, you do not have to store empty space of the object in image files. See Support for Various Disk Partition Schemes and File Systems for the list of supported file systems. Shows the estimated size of the image file. An actual image size depends on how much empty space is on the selected partition and what file types are there . You may set this option to Automatic and let Windows decide how to split the image file. This mostly depends on the file system on the destination disk. You may also either explicitly specify the split size, or choose a preset for various devices with removable storage. Select Fixed size for that. You may protect your image file with a password. Note: This feature provides a relatively moderate protection against conventional unauthorized access. You may attach a text description to the image for annotation. Maximum length of the description is 255 characters. You may specify backup options on this panel. They are used to create consistent point-in-time backups. See Creating consistent point-in-time backups for more details. You may also create a script for this action. Click the Script to Clipboard button and paste the script to any text-processing utility. The Progress bar will show the progress of the current operation and overall process. When the image is created, the Image created successfully. message will appear. You may cancel the current operation by clicking the Cancel button. The Operation canceled by user message will appear. You may create a system recovery disc(s) for your system if you select the Include R-Drive Image bootable version option on this panel. You may start your system up using such CD/DVD disc and recover the data using the R-Drive Image startup version . Then select appropriate CD/DVD Media Options . Leave Use ISO caching selected unless you have problems with data recording on a disc. When you click the Start button, R-Drive Image will open the CD-R/RW drive tray and the Insert a blank CD-R/RW disc... message will appear. Insert a blank CD-R/RW disc and click the OK button. Each time R-Drive Image fills the disc, the Insert the next blank CD-R/RW disc... message will appear. Insert the next blank CD-R/RW disc and click the OK button. If you mistakenly insert a non-empty CD-R/RW disc, the CD-R/RW disc is not empty... message will appear. Change the disc to another empty CD-R/RW disc and click the OK button. Supported CD and DVD Recorders . When the removable disk in the device is full, the Disk is full... message will appear. Change the disk and click the OK button. Follow the device instructions on how to change its disks. It is recommended that you mark the disk accordingly. You will start restoring the data from the last disk. Go to the Restore Data from an Image topic for more details. 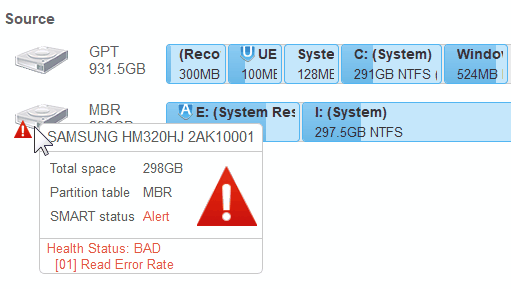 When R-Drive Image encounters a bad sector, the IO Error message will appear. You may either cancel the current action or fill the bad sectors with zeros.